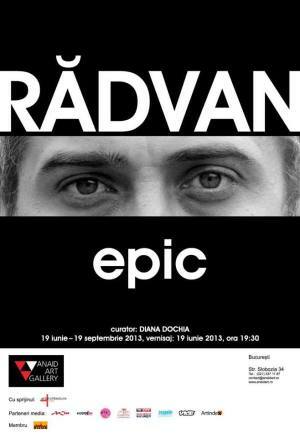 Wednesday, 19th of June 2013, at 07:30 will take place at ANAID ART GALLERY the opening of the exhibition "Epic" signed by Alexandru Rădvan, curator Diana Dochia. The persons who are found of contemporary art will be able to visit de exhibition during 19th of June – 19th of September 2013. Alexandru Rădvan is a graduate of National University of Arts in Bucharest and assistant professor within the faculty of painting at the same university. His artistic creation exceeds over a decade, during which the artist exhibited in Romanian galleries and museums as well as abroad. Having an extremely coherent and well designed artistic program, the art of Alexandru Rădvan excites the consciousness and memory of the viewer or art collector, his works being displayed in numerous international group exhibitions and solo shows that were unfailingly organized over the years. He exhibited in Hungary, Germany, France, and Luxembourg alongside well known artists as Andres Serrano, Georg Baselitz, Bill Viola etc. Alexandru Rădvan’s presence at the contemporary art gallery Anaid Art Gallery is already known for the art lovers and professionals. Since 2005, Alexandru Rădvan is represented by Anaid Art Gallery, being one of the most important Romanian artists of his generation. The exhibition “Epic”, as the artist confessed “is about Ulysses and I, Alexandru Rădvan, about the strong relation between us. For me, Ulysses is not a mythological character, he really exists, he is alive and lives in me since I was a child and I was being read from the book «The Adventures of Ulysses»”. The total identification of the artist Alexandru Rădvan with the Ulysses character generates an ample series of drawings, cement reliefs, paintings and large size sculptures. They underline a personal odyssey which reflects the moral and physical portrait, their deeds and relations regarding the environment in a relative objectivity. Anaid Art Gallery invites you to make an incursion in contemporary art from Monday until Friday: 11:00 a.m. – 07:00 p.m. and Saturday: 10:00 a.m. – 06:00 p.m.
"EPIC - Alexandru Radvan" Art Show in Bucharest. You can get here description, reviews, address, time and details of "EPIC - Alexandru Radvan" Art Show in Bucharest. Visit Bucharest Tips for more Art Show events in Bucharest!